Just the other day our Prime Minister, Malcolm Turnbull, addressed a group of 600 guests eager for insight into the mind of the leader expected to lift Australia to great heights. Our national pride and optimism was about to be on show in its full, stirring glory. Not, however, on an empty stomach. This was the task given to me as usual, by Michael Yabsley, my collaborator in the Wombat Hollow Forums…. to feed the mob and whet their appetite for the feast of ideas and inspiration to come. The strategy was simple; showcase the outstanding work done by our farmers and small producers… add a few creative touches and in my address to the group, let them know that due to the efforts of farmers and producers like those here today, Australia had now climbed to second place on the list of world’s greatest eating and drinking (wine) nations. Look out France…. we’re a very young nation with a silver bullet and you’re in our sights. Scott Wilson and his Mum, Maureen Wilson, have been growing high country Black Angus Cattle in Scone for 30 years. The hand selected and dry aged tenderloin especially for my Korean inspired char grill with bok choy and sesame bean sprouts had carnivores mooing for more. Kel and his wife Mahlah milk just 18 Holstein cattle, are 6th generation dairy farmers who value being a small producer because “It’s easier to produce great quality, remain sustainable and ethical and exactly fit the customer’s needs” Amazing! Truly and remarkably inspiring. Well done… your Vanilla Ice cream was a hit on top of 5 apple frangipane tart… apples picked from our family orchard the day before. Can’t get more Australian than this, can we ? I made our family favourite pie filling… Greek Lamb. This was delivered to Shepherds Artisan Bakehouse in Sefton, where Michael Shepherd applied his artisan craft as master baker and transformed them using his outstanding handmade pastry and decades of experience into the raved-about “Prime Ministers Pie”. I tip my hat to Michael’s bakery skills, manipulating temperature, oven moisture and time to create the perfect balance of filling to crisp light pastry. Bravo! Jack Mitri who was also representative on the day felt it was fit for a king and shouldn’t be wasted on a mere Prime Minister. Jack is now in prison. 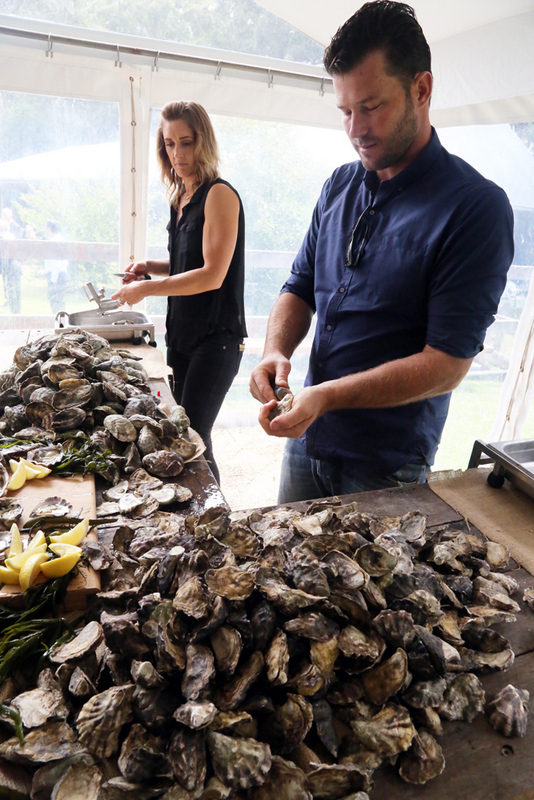 Ewan McAsh and partner Louisa (looking like super model triathletes) personally retrieved outstanding oysters from the Clyde River in Batemans Bay at 5 am and shucked them fresh as could be to bedazzled guests 6 hours later. 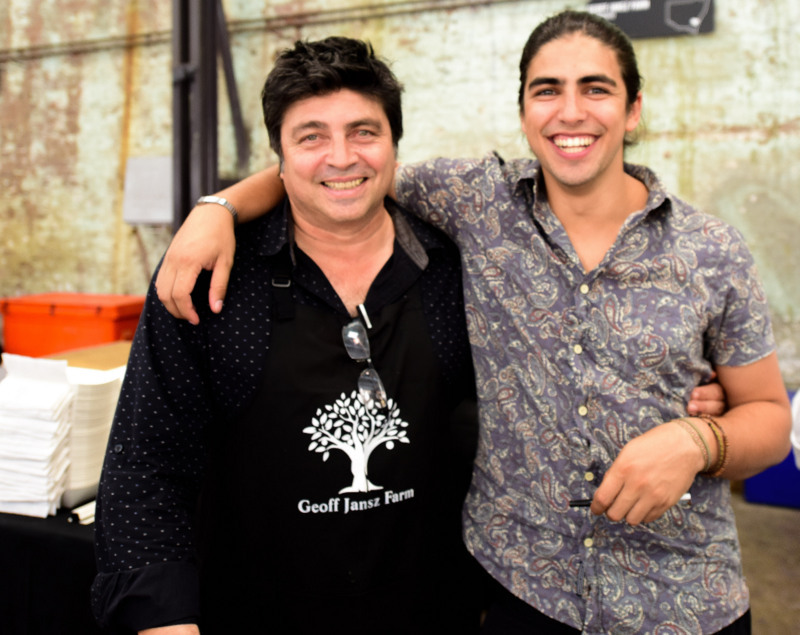 Many thanks to my fish hero and friend, John Susman from Fishtales for introducing me to Ewan as the obvious choice of someone who encourages farmers to fully grow out oysters rather than rushing them into market for a faster dollar. 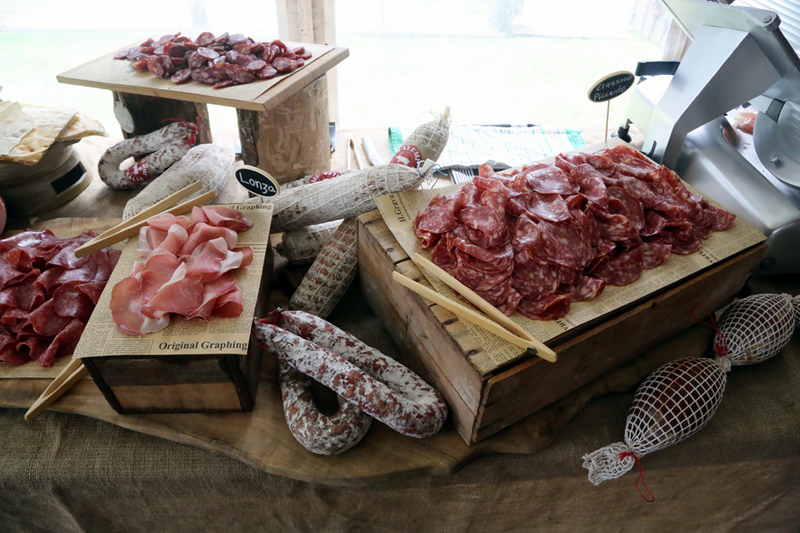 We are all huge fans of the outstanding charcuterie being produced by “Salumi Australia”. Michael Dlask … nicknamed “the Smiling Slicer”, cheerfully carved off slice after slice of perfectly moist, properly aged and full of lingering, complex, sweet and interesting flavour. Please lord, in my next life make me a pig and may Michael and master salumier Massimo , turn me into their cacciatore. My team and I, of course spent days prepping for the event, but felt honoured to be working with the people and produce thus named. 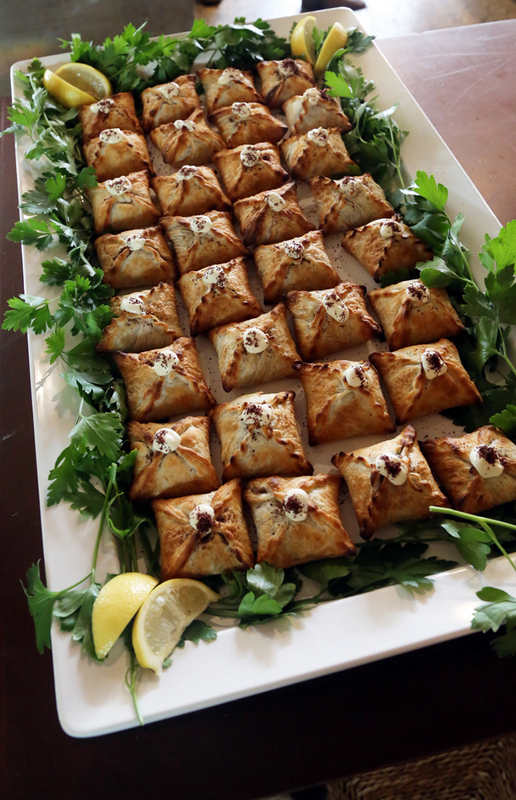 If you’re considering a gathering where food is to be served, let me highly recommend that you contact any of them to supply show stopping quality which will have your guests raving. 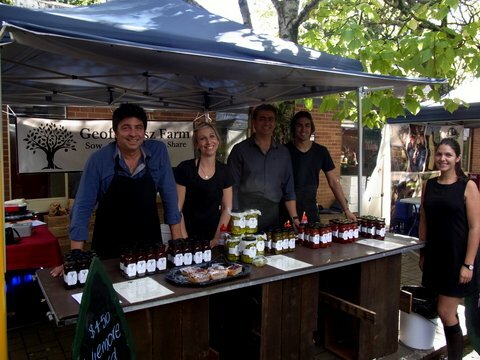 From Geoff Jansz Farm, our team, Michael and Susie Yabsley…. and I’ll bet, The Prime Minister… a very big thank you. 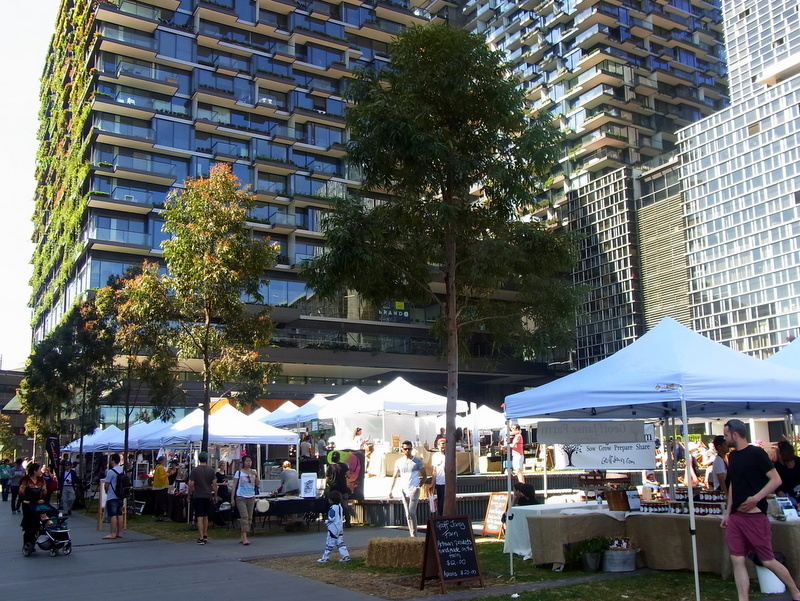 On Sunday 12th October, two young city dwelling professionals launched the Brewery Yard Markets in Central Park, Sydney, Chippendale. 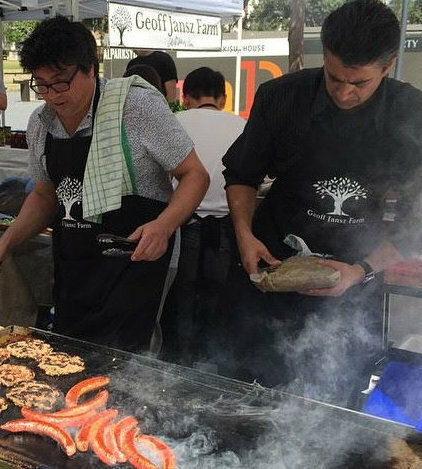 20 somethings, Jacob and Rupert, created a buzz with a young, fresh and dynamic marketplace on the lawns of the Central Park hub, alive with a constant stream of bands on the main stage, stall holders displaying an eclectic range of food, fashion and craft. 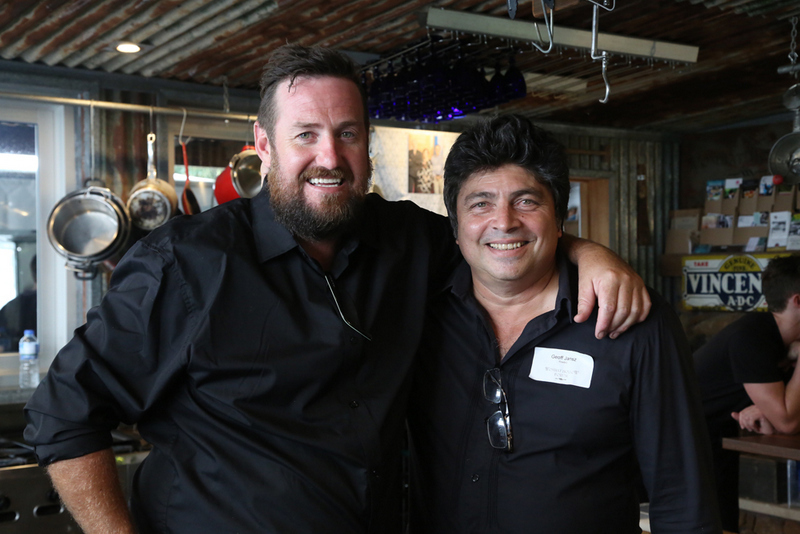 Geoff Jansz Farm was delighted to play an ambassadorial role with the food served there. Ambassadorial in this sense: the surrounding buildings and courtyard space beneath have been designed to be clean, energy efficient, green and sustainable, an amazing urban innovation that will hopefully inspire more of it’s type. Geoff Jansz Farm is based on these same principles. But more than this, we strive to showcase the produce provided by other small farmers who also care about beautiful flavours prepared in ethical and sustainable ways. We use these ingredients in combination with our farm grown produce to serve wholesome food on the day. For the innaugural markets, we featured Salumi Chorizo and Egg Rolls, amazing start to the city morning made with lettuce and slaw from our garden, mayo that I had made the day before and extraordinary eggs from Dunollie Rare Breed Farm Eggs. 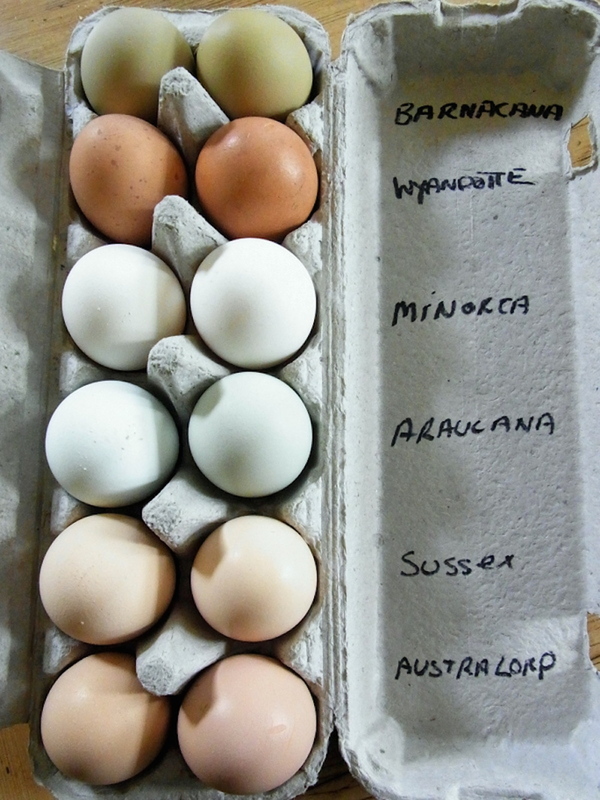 Look at the amazing blue and olive coloured ones, all the same inside though, fresh and vibrant yellow yolks. Furthermore we provide contact details to anyone wishing to procure this produce beyond the fortnightly Sunday markets. Look out Sydney…. we small farmers are coming to you! 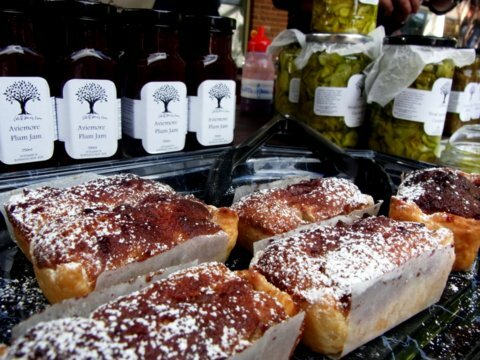 Next market is on Sunday 26th October. If you can’t make it, you can always order our range online. 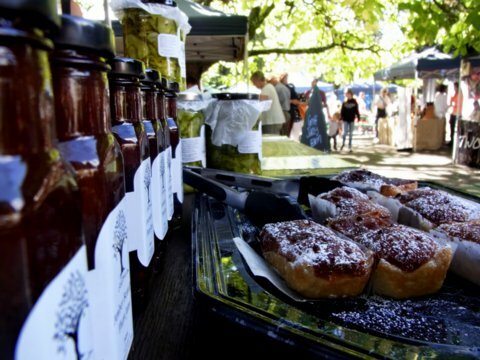 Why the Bowral Farmers’ Markets? 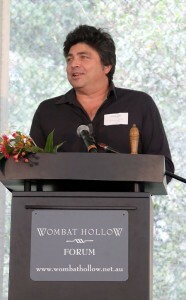 We were all there; all of us who have worked so hard towards the Geoff Jansz Farm project of “Sow Grow Prepare Share”. Family first: Angela and Tash, the website queens, Russell who is driving me to produce my three best hand-made products, Harry, my Monday and Wednesday farming buddy, Jonny, my taste tester, and lurking in the background, my Mother Val. And wedged in amongst a sea of Janszes was Jacinta who puts things together with me back at the Farm. Even Mara turned up on her day off! 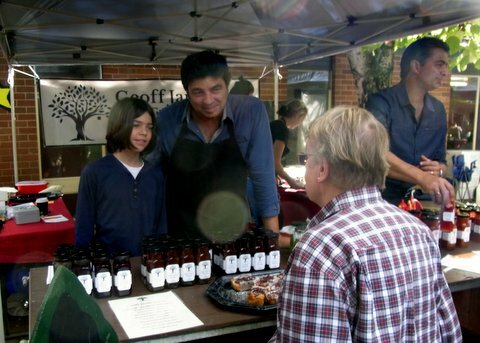 The day at the markets was a culmination of everybody’s amazing efforts and belief. We are all local and revelled in an honest days work and participation in a community day out. I highly recommend anyone capable of sustaining a supply of genuine quality locally made/grown foods to seek out their farmers’ markets and participate. It’s a deeply satisfying and potentially financially rewarding experience. We have an exciting week ahead of us here at Geoff Jansz Farm. 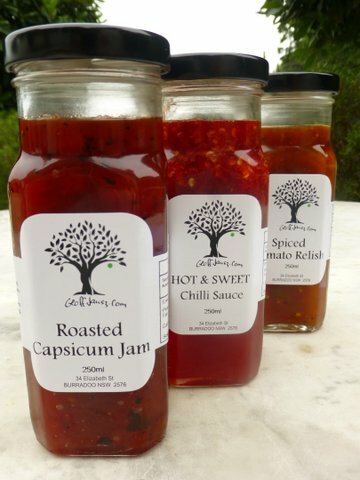 Geoff has been locked up in the kitchen cooking up batches of our three favourite products; Roasted Capsicum Jam, Hot and Sweet Chilli Sauce and Spiced Tomato Relish. This means we’ll be opening out online store and will start to ship these wonderful jars in the coming week. 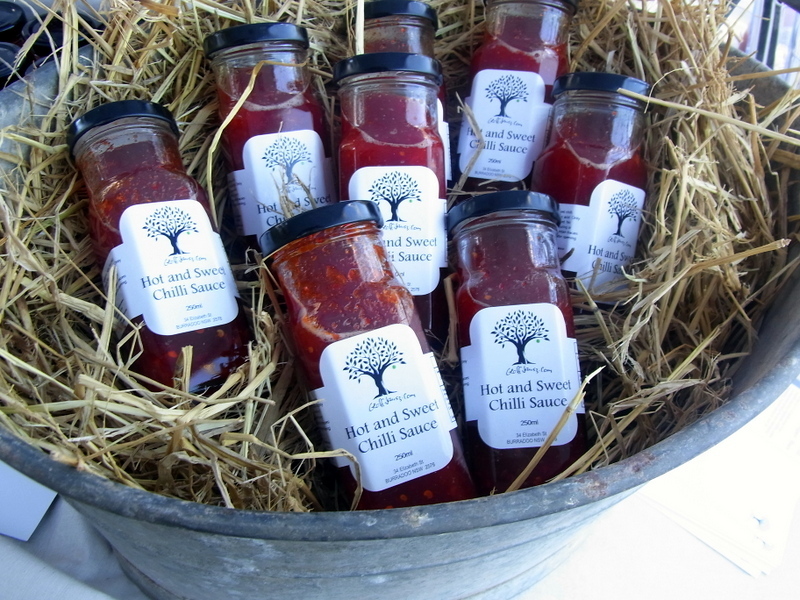 Stay tuned for the store’s opening and for Geoff’s recipes and ideas for how to use the Jars from the Farm range. 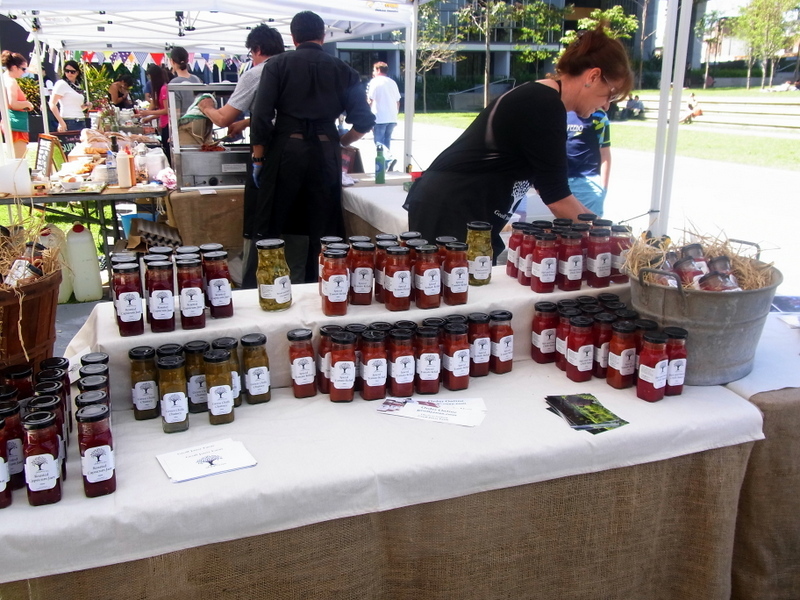 We will also have a stall at the Bowral Public School Markets on Saturday 8th March. 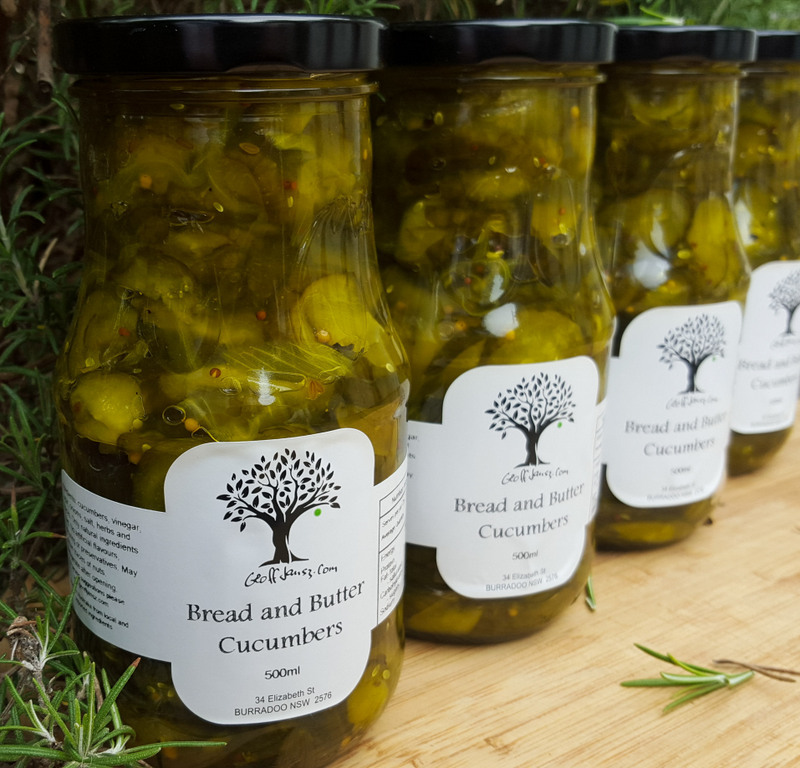 Alongside our three hero products, we will have a few special one-off pickles and jars that Geoff has been playing around with on the farm. 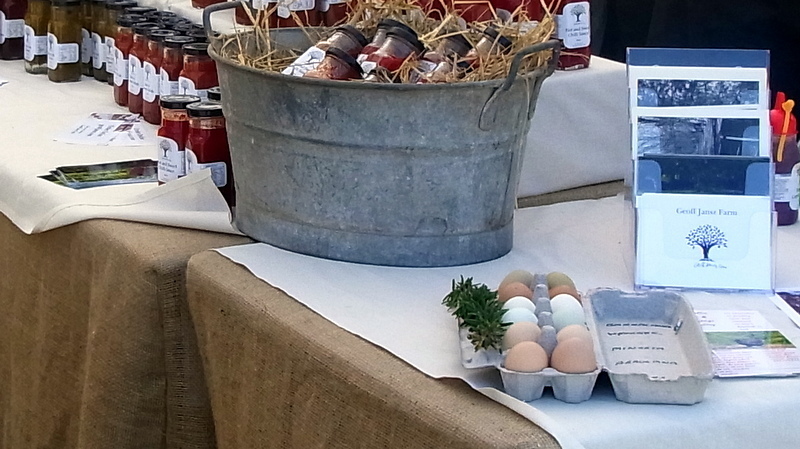 We will also have great food to enjoy on the day, made from ingredients straight from the garden. A rustic tomato soup using Geoff’s Special Tomatoes, Pear and Apple Frangipane Tarts and more… We’ll be there from 8.30am-2pm, so come say hello and have a bite to eat. 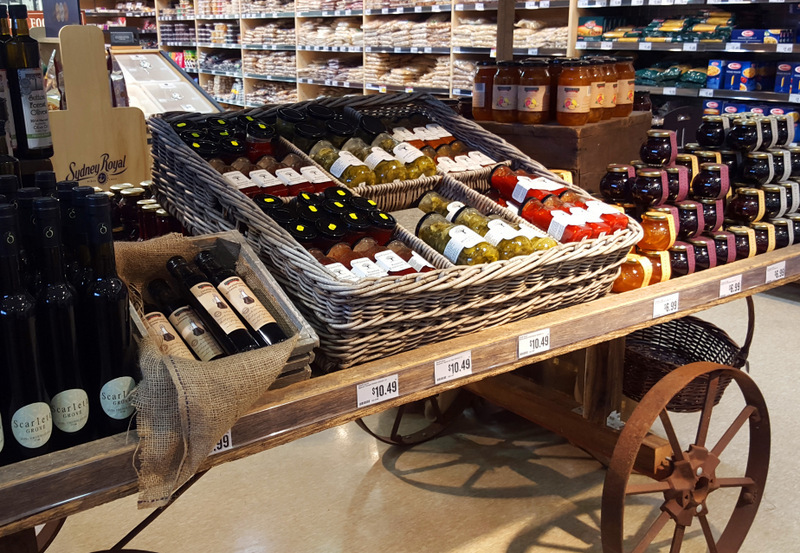 Whether Feeding the family, supplying the restaurant or farming for a community, maintaining a steady supply of produce to match the needs of your group is one of the great skills of the grower. Over the years I’ve either harvested enough for Africa or begrudgingly bought a cucumber when my plants were only flowering. 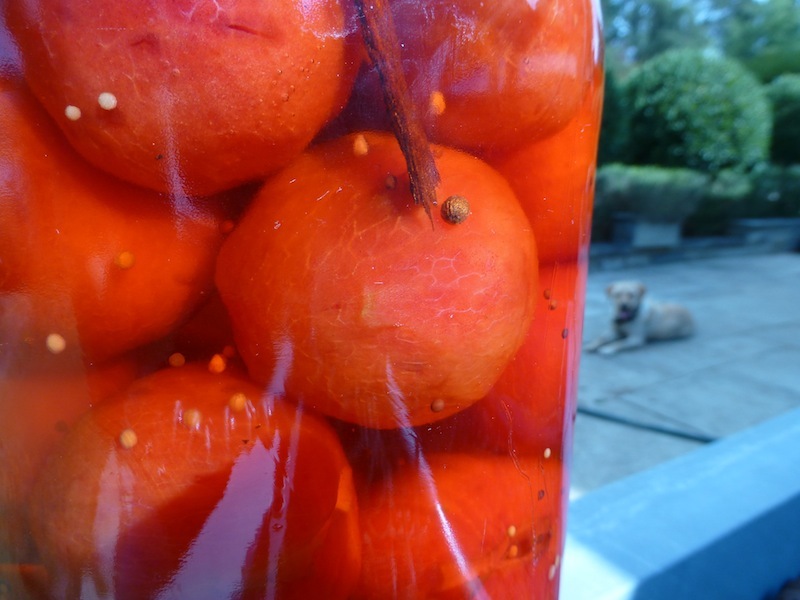 Actually, I prefer the feast over the famine of a particular crop as it allows me to pickle, preserve or give away. 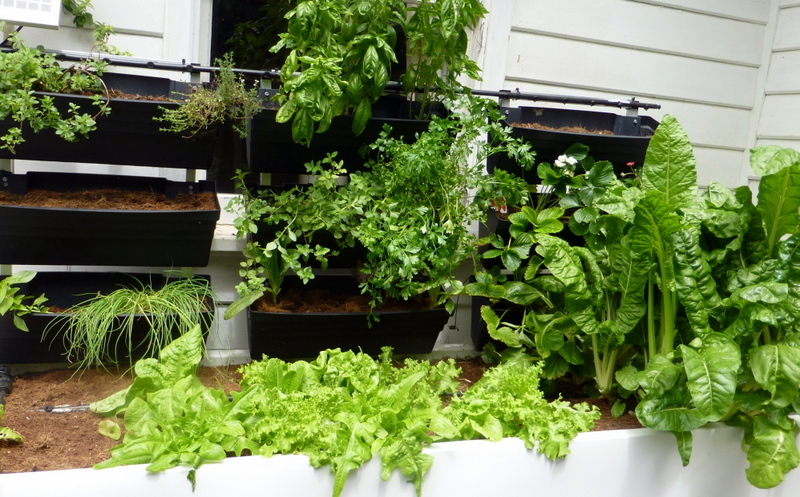 Here’s our Elevated Garden; abundant, verdant and in danger of giving all one sunny day. 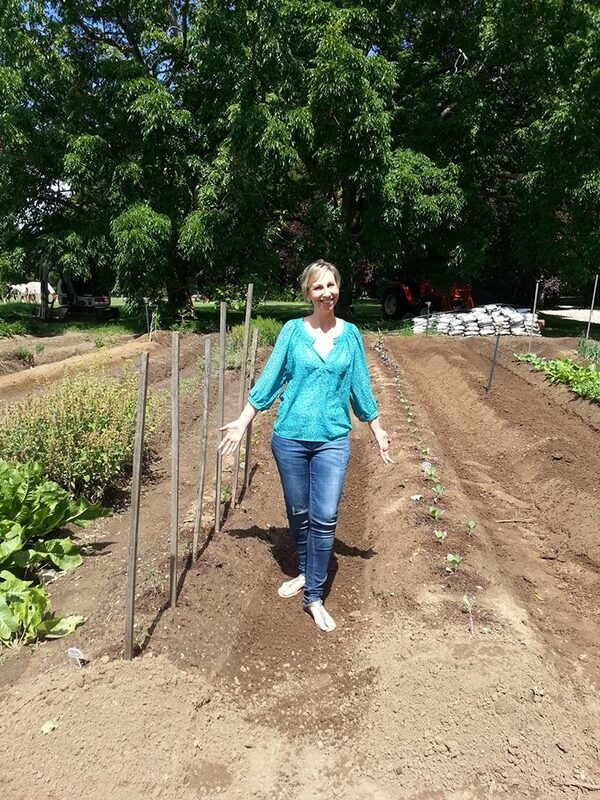 Farmer Jacinta is popping in some Cos and French lettuce seedlings we grew in anticipation of these vacant spots created by a previous harvest. If you don’t always want to buy from the nursery, raising seedlings is quite simple and an adventure in itself. 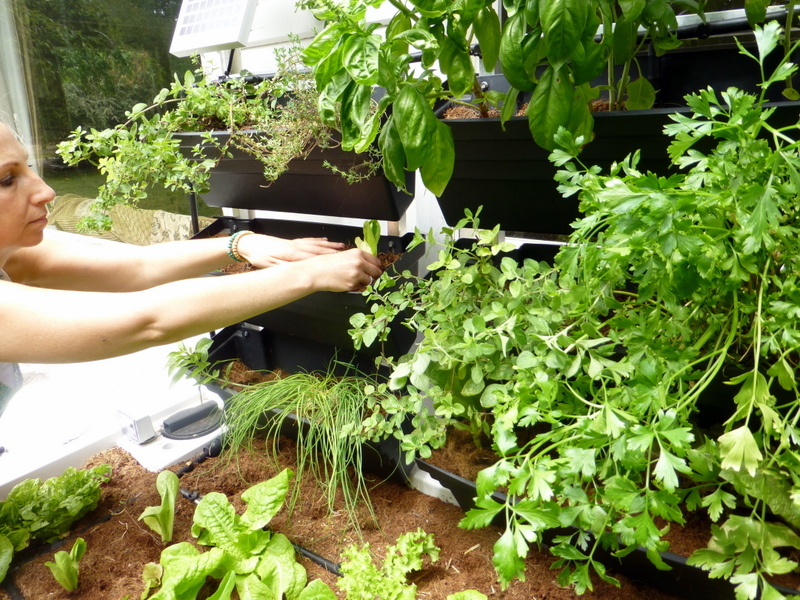 It can also be done indoors if you have limited space. I will post a few different methods on the farm site soon. The joys of growing your own. 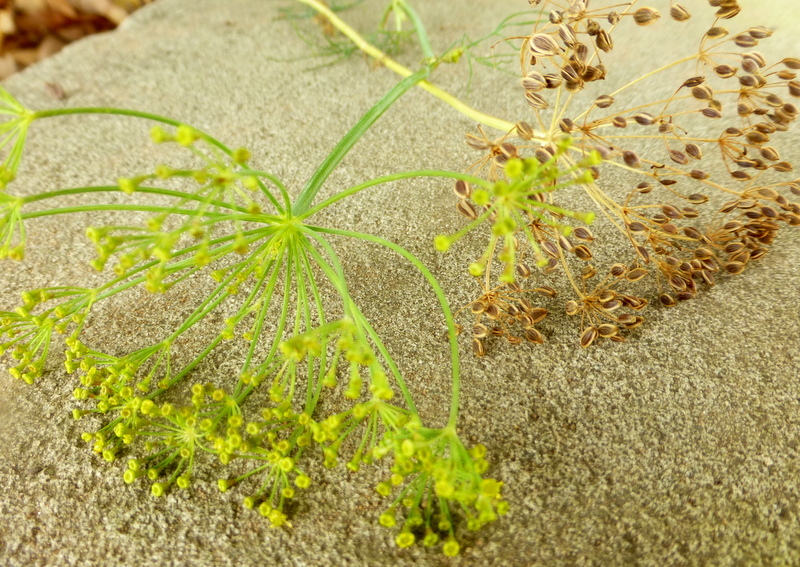 Here are some dill flowers. While still yellow and young I include them in my much-loved Bread and Butter cucumber recipe, which we sell to delighted customers at the next Bowral Farmers Markets. At this stage, the flowers impart an intoxicating more austere and volatile dill character, which sits surprisingly well with the baby cucumbers we grow. Both in season at the same time! Incidentally, this is how flavour combinations have been imprinted on our food psyche; only ingredients that were on hand were combined. 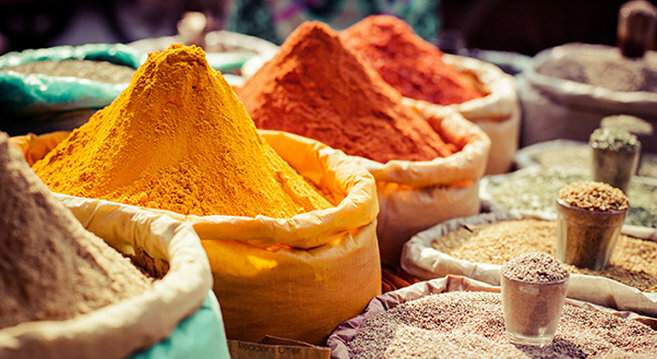 This is why when you visit countries with a long tradition of cooking, you encounter a fair percentage of locals who are staunch with what goes with what. I find this charming and in fact look for it on my gastronomic adventures. However, being a cook in a new world country like Australia, I don’t feel confined to the ingredients from the country of origin. Experimenting, based on respect for the country of origin, learning their time honoured skills and never feeling superior is the way of the new world cook. I digress. Next to our yellow little cucumber companion is it’s older brother. The dried seed flower. He also started out, young, supple and cucumber worthy, and now he has evolved into the father of the next generation of my dill plants. 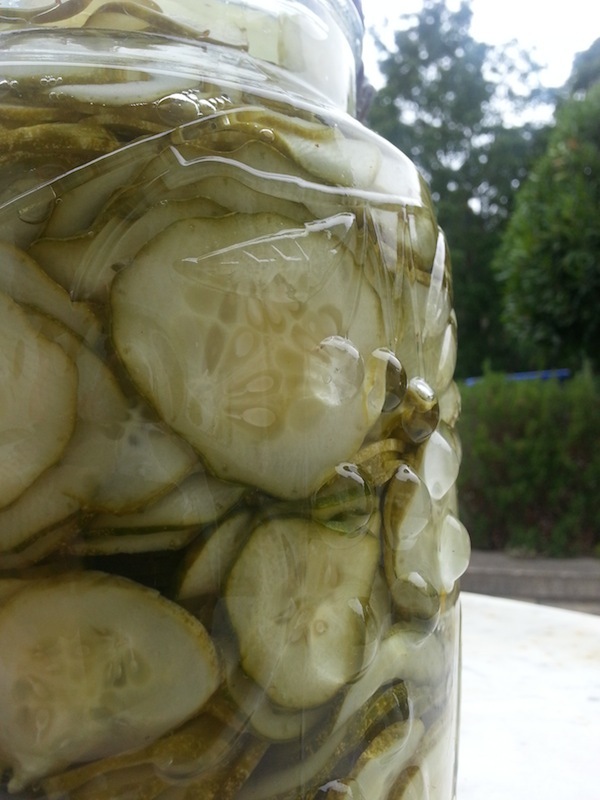 Some seeds will go into my cooking over the following year, but largely, I save dill seeds. Sneak preview of Gerald’s corn. The bloody Cockatoos have had their eyes on my field of dreams! Seriously… I am not paranoid, I sooshed off one that landed on the top of the strongest plant only yesterday. Anyway, have a look at this little baby wrapped in silky, husky Heaven; safe, secure and one week away from boiling water. 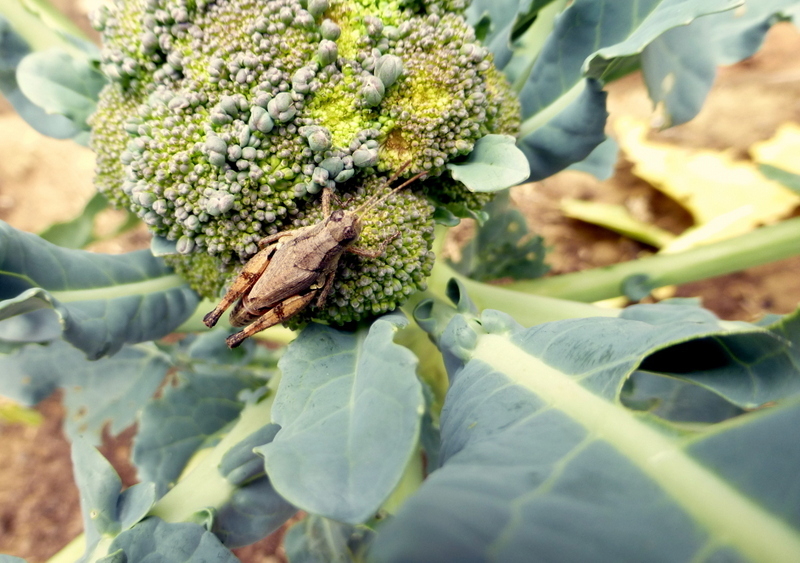 Have a look at my Broccoli, Hopper. Cardamom. One of my all time favourite spices. Dave diMarco gave me some plants which I eventually stuck into the ground. Thought an apology was to be offered to Dave for being slow to plant and probably killing his gift, but no! The cardamom fairies came to me after all. Here’s evidence of underground activity. New shoots are emerging a few centimetres from the main stalk. I am so, so excited by this. Also, I can’t wait to experiment with cardamom leaves. 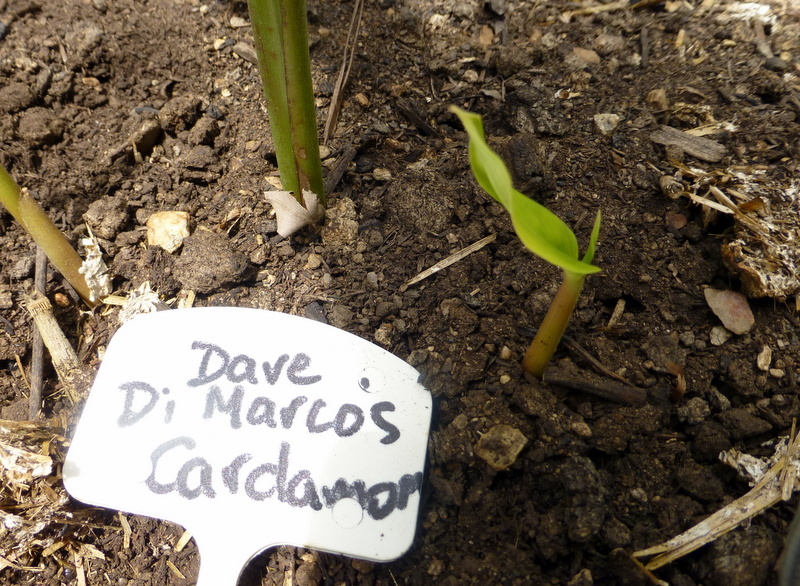 Like the tumeric, ginger, galangal, curry trees, lemongrass, Vietnamese mint (so far) in my tropical section of the poytunnel, the cardamom will be transplanted there to see if it will survive the Bowral winter… Even if I have to sleep along side to supply body heat. Keep you posted. Courtesy of Gerald from Bonaccord Ingram Co in East Gippsland. A few weeks ago I decided to drive to Bairnsdale and meet the Elders team there. I currently hold the land speed record for driving over Mt Hotham in an effort to be on time for dinner after the road was closed for 2 hours. Anyway, Noel took me to visit some of the wonderful farms in this lush part of the world. There’s a point I’ve been making over the years and I’d like to develop it further through the website and eventually an e-magazine being planned with photographer Dean Cambray (more later). That point is that inside every big farmer there is a small farmer. Perfect evidence of this was in the form of Gerald and Murray from Bonaccord Ingram Co. Although hands on and flat out delivering wonderful produce to a very large market, we were able to connect on some really important stuff. I made a passing comment that corn was generally lacking flavour these days; that varieties were heading towards being sweeter (Supersweet Me!). Gerald did a cartwheel in agreement. He gave me a bag of seeds of corn that didn’t follow this shallow trend and they’re planted next to Jacinta in the photo below. We went on to tackle onions, beans and special tomatoes. Couple this with the seed and seedlings given to me by local horticulturist Dave DiMarco, I have two rows of Bairnsdale “hero” produce alive and growing. Soon I will post a simple but amazing cabbage salad using the Bairnsdale cabbages. Well, here are the beans. Following Geralds instructions I planted them differently; in straight rows but this time each seed only 5cm apart, instead of 20cm. One hundred percent germination was expected, but I was delighted with the heavy cropping. Each bean seemed identical in size to one other, which some in the restaurant trade could consider an advantage. To me? Not so important. However, the flavour was outstanding. 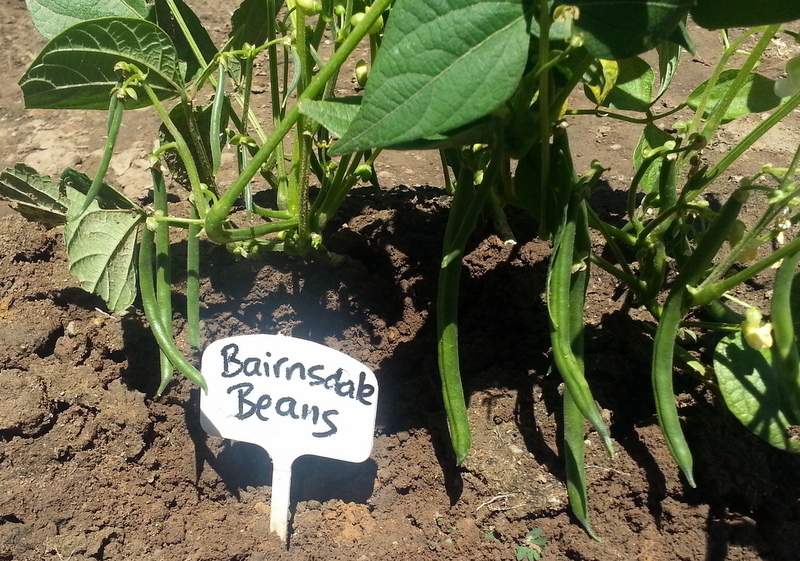 Raw, they were crisp, luscious and full of deep earthy bean flavour. Cooked, even better. I will find out from Gerald what variety they are and if generally available. Three years ago these birds, or their parents, ate EVERY apple over one weekend. No wonder I ran out and shot them…. with the camera that is. Even netted, my fruit presents a small challenge to aerial raiders . Rats with wings! 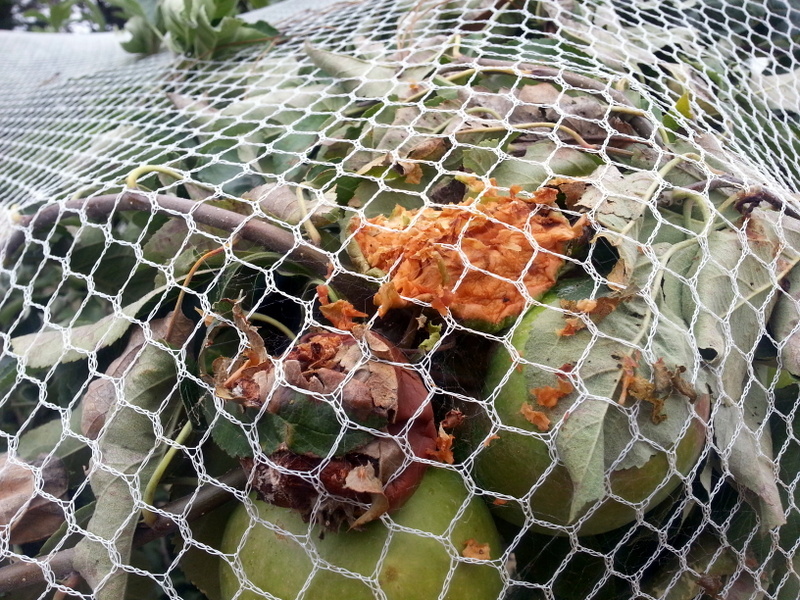 Here’s evidence that a pointy beaked species has pecked the fruit pressed against the netting and therefore still accessible. No big loss, but worth a mention. My netting allows sunlight through which ripens and enriches the fruit however as you can see doesn’t offer protection from the fierce rays during recent heat wave conditions. Again, no big loss. The “big daddy”, the B52 bomber of the blitzkrieg is the “sulphur crested cockatoo” If you weren’t on their flight path, it would be easy to be entertained by their attitude and antics. Raucous , mischievous, acrobatic, fearless (compared with other winged thieves), handsome and determined. 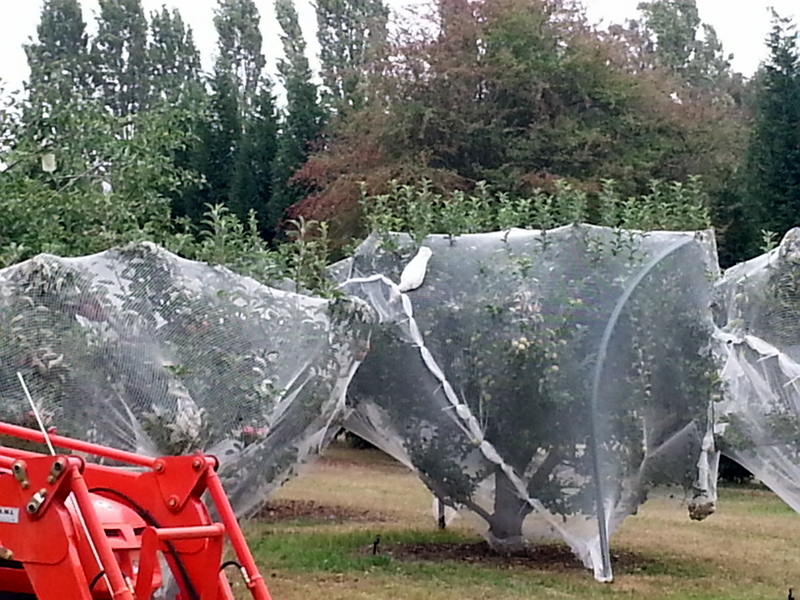 When you have an orchard they’re devious, cunning, stealthy, destructive and wasteful . Have a look at this guy…. you probably can’t make it out, but walking along the netting like a trapeze artist on a safety net, this bird brain is tugging the cable ties we used to sew the nets together. What the ! Clearly they’re clever and hats off for that. But just add them to the long list of enemy forces to contend with should you wish to grow noticeable quantities of great Australian fruit. Babaganoush (our Labrador) is currently being fitted with a jet pack. A festive, prized ingredient that reeks of summer is the Zucchini blossom. Pick them in the morning when they are open; the suns rays triggers the flower to close. 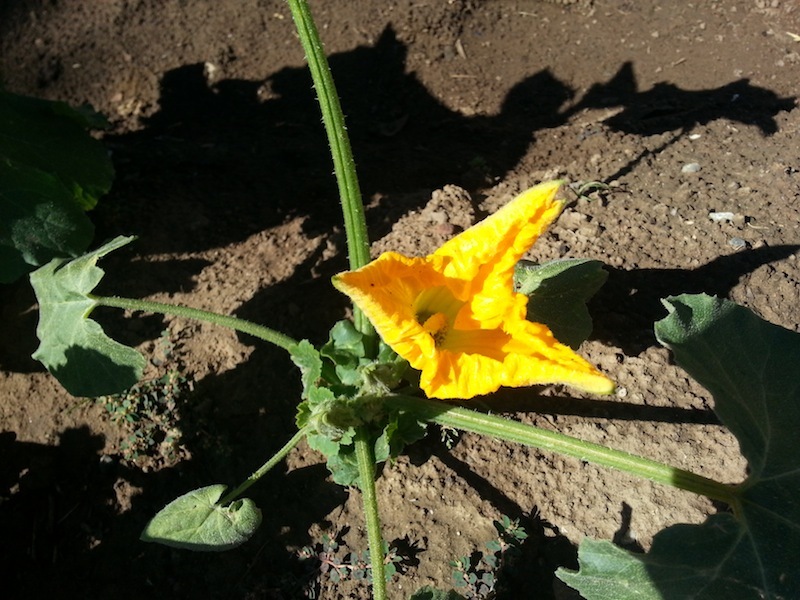 The male flower has the zucchini attached while the female flower is on a stalk. 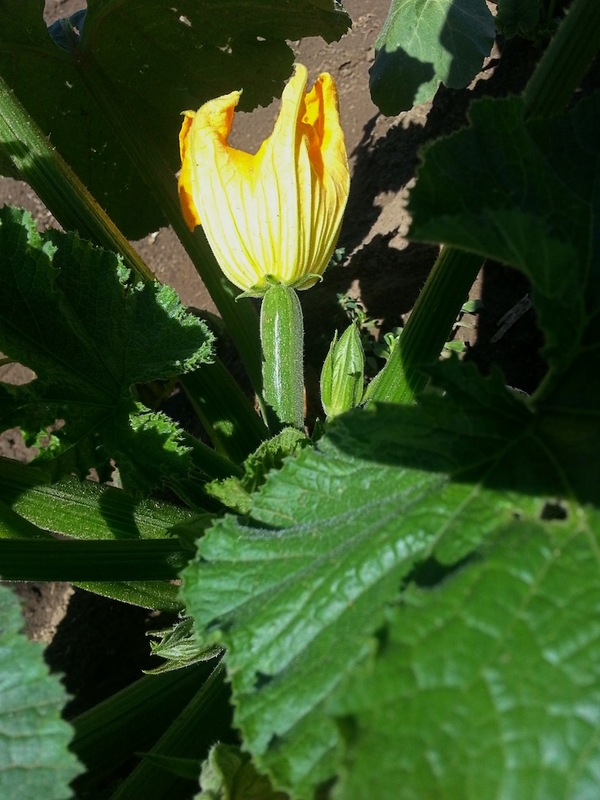 I either leave the male to reach full term in it’s pregnant state and then harvest the zucchini, or pick the male flower with tender young zucchini attached. In my restaurant days, we’d snip out the stamen and stigma, fill the flower with crab mousseline and steam them. The delicate art was in keeping the flower still attached to the zucchini which was subsequently fanned onto the crab bisque reduction. Back then Flock of Seagulls and Wham were on the music charts and I used to tuck my shirt in. Now that the shirt is out and I listen to Justin Bieber, I’d still do the stuffed zucchini flower. I will post a recipe soon for a light batter and quick fry of the female flowers. Here it is! The first vine ripened tomato for the season. 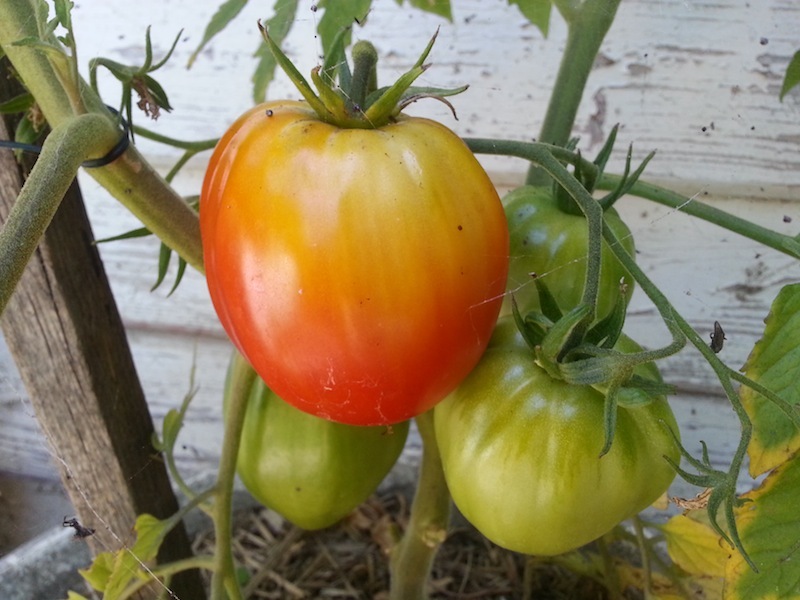 Grown on my patio, it had the jump by 3 weeks on the ones planted in the field, so naturally it was going to go red first. Boy did I have a hard time holding back the pests… The most threatening being Natasha who has just left to head back home to Melbourne. She has been circling the patio for a week, innocently asking when I thought they would be ripe. Well Tash, I’d say in about a couple of days. Just have to keep Baba Ganoush (our Labrador) away and the bruschetta is all mine!